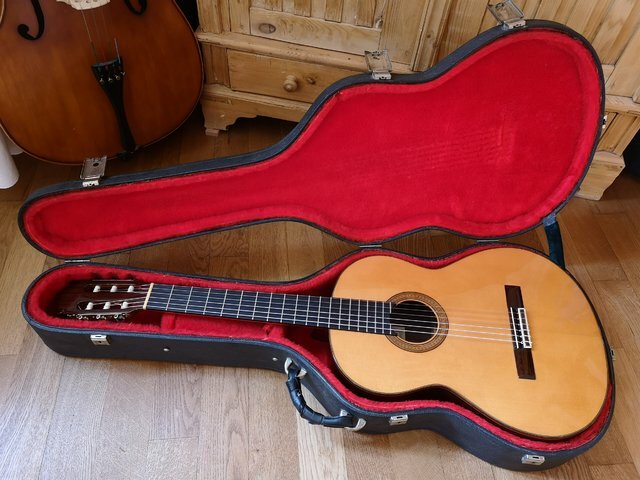 The famous Spanish luthier Santos Hernandez died in 1943. 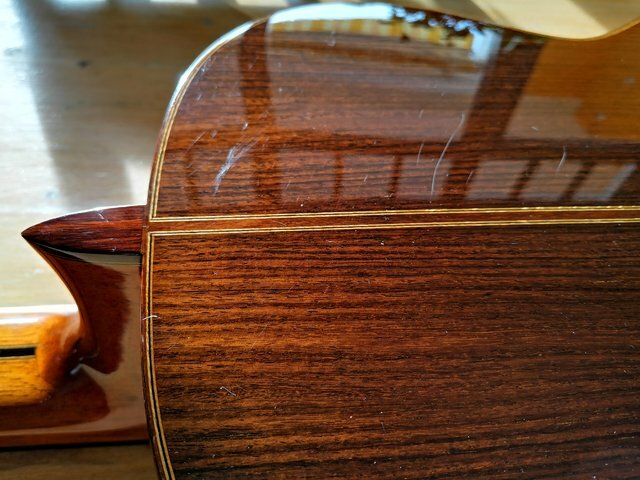 His wife Matilda Ruiz continued the workshop and hired Marcelo Barbero, who completed the guitars Santos Hernandez had begun. 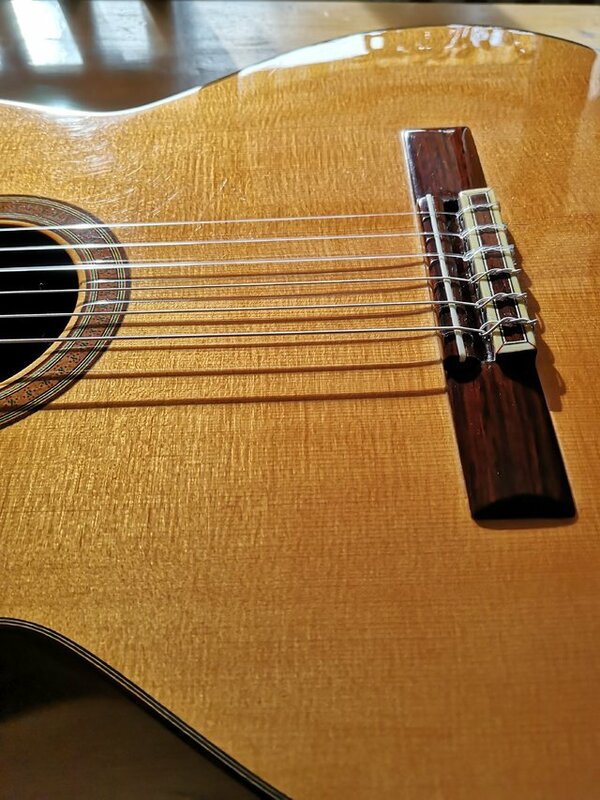 The guitars were named "Vda de Santos Hernandez" (Vda stands for Viuda = widow). 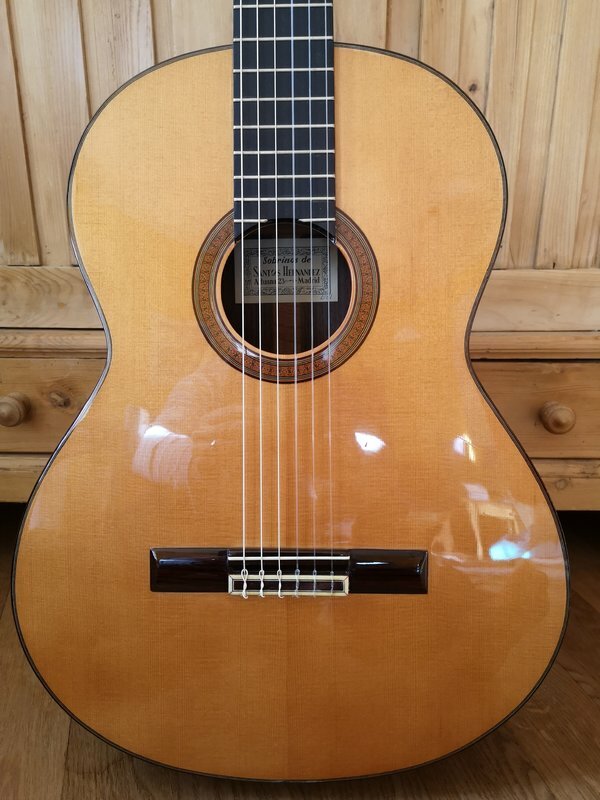 After three years Barbero left the workshop and Feliciano Bayon followed as Luthier. Feliciano Bayon married the niece Esperanza Ruiz of Santos Hernandez's widow. 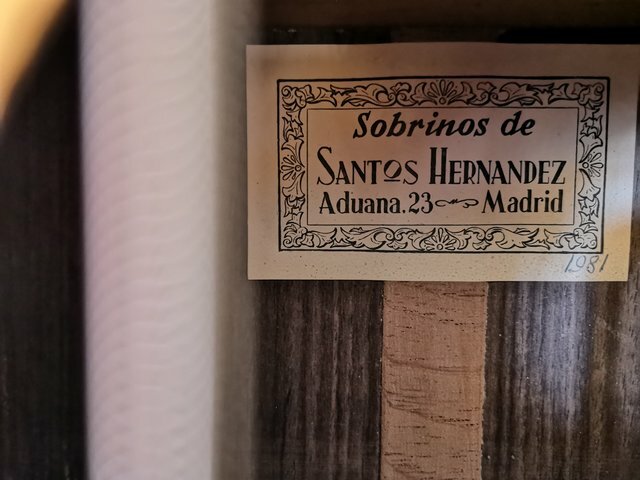 The brand name changed to "Vda y Sobrinos de Santos Hernandez" (Sobrino = nephew). 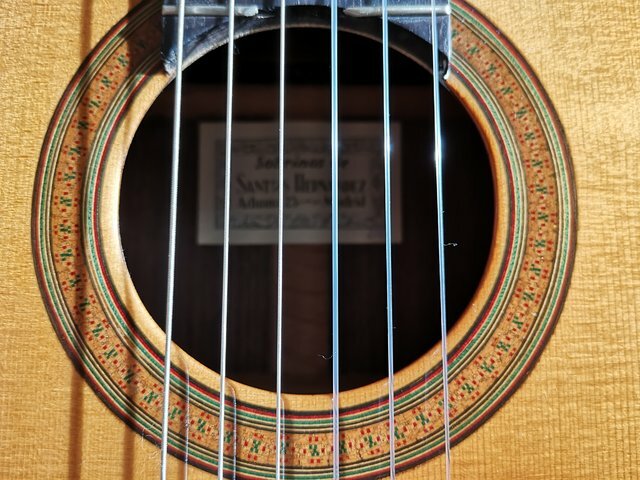 After the death of his aunt Matilda Ruiz, the built guitars were built and sold under the label "Sobrinos de Santos Hernandez". Feliciano Bayon used the legacies of Santos Hernandez, such as tools and plantillas. 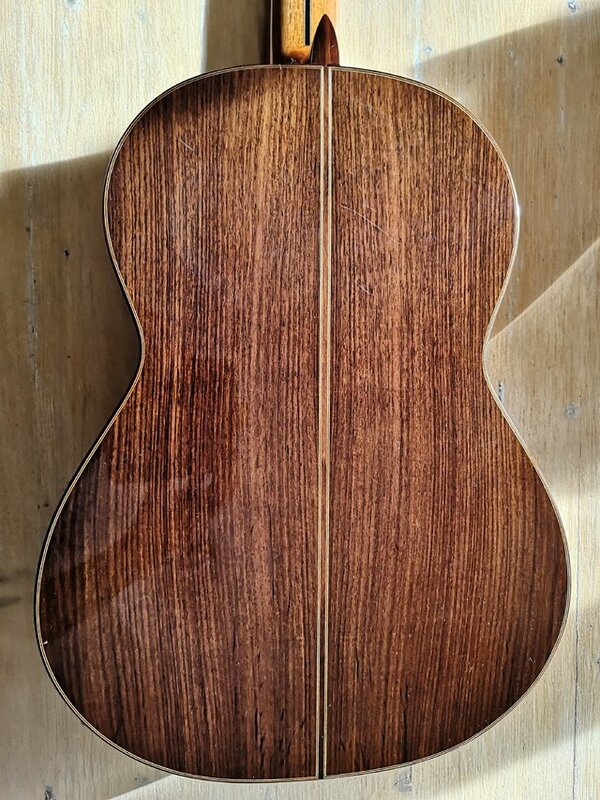 His rich experience in guitar making and the study of many guitars of famous spanish luthiers were incorporated in the construction of his guitars. The workshop has been continued since the death of Felicino in 1997 by his son Santos Bayon Ruiz. 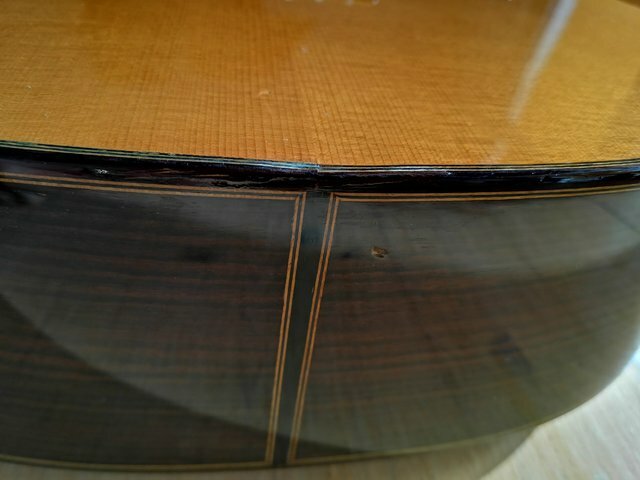 The guitar and the case have the usual signs of wear for the age. The direct influence of Santos Hernandez on Feliciano Bayon is probably questionable. 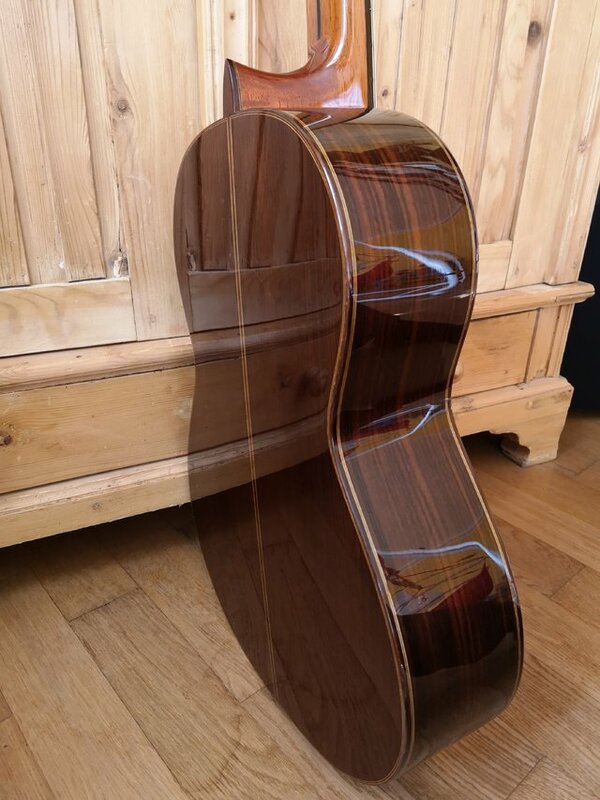 However, this guitar is also masterfully built, in the Spanish tradition, as well as with the finest woods. 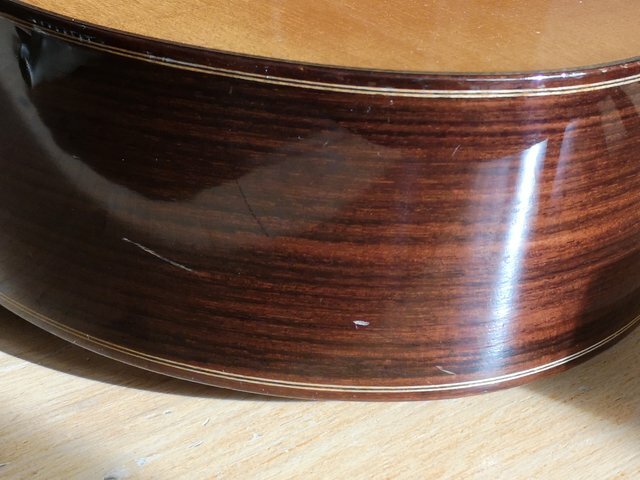 The soundhole rosette is very finely designed. 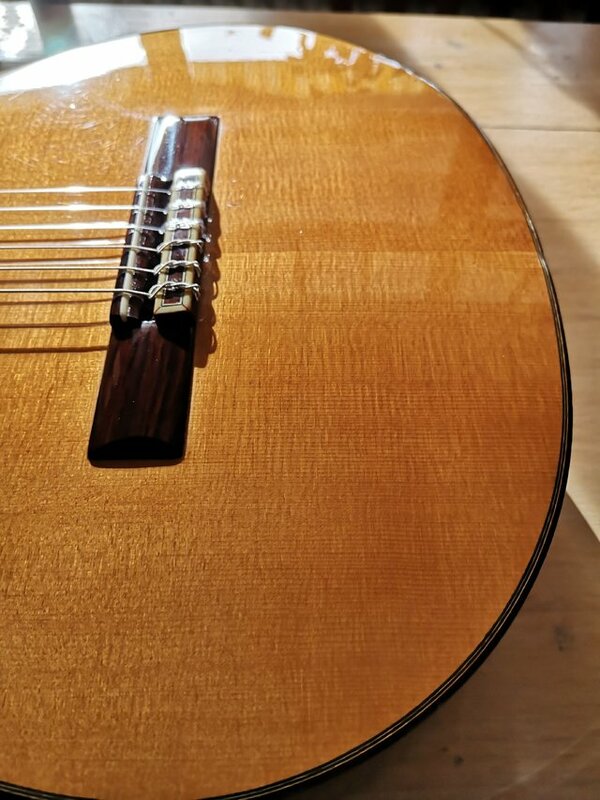 The outlines of the guitar are almost identical to an original Santos from 1935. 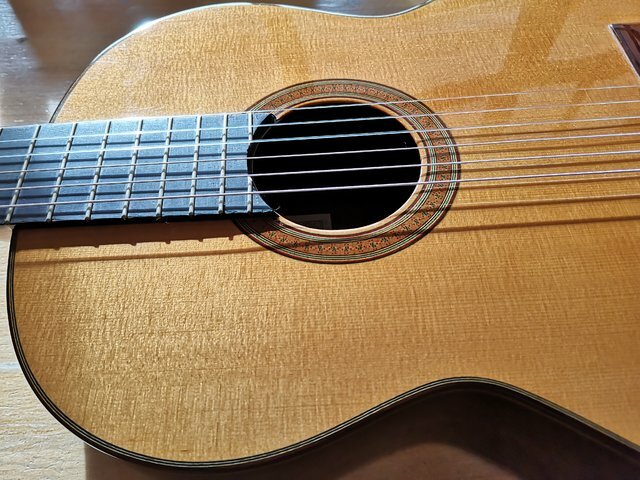 The guitar impresses with its great balance over all strings and frets, its powerful sound and a Spanish "lyrical" character, especially in the high registers. 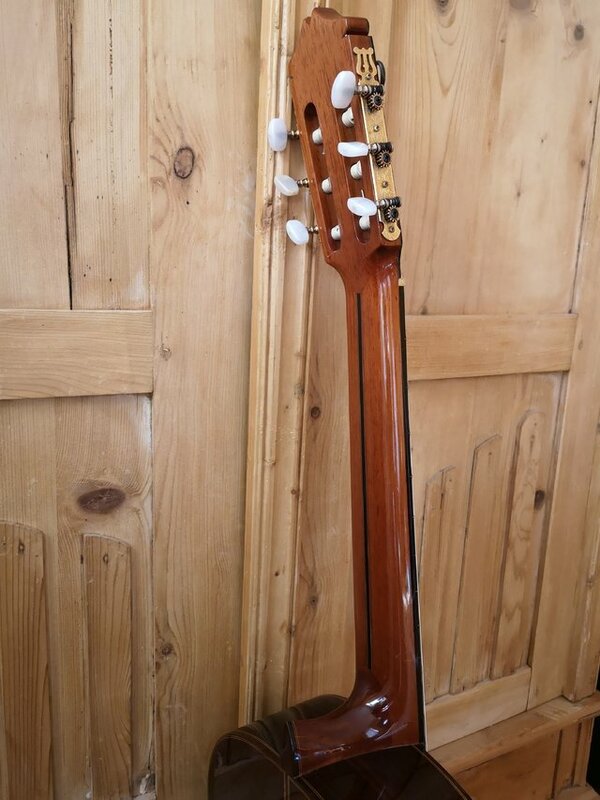 The guitar can be viewed and played in Bamberg, Germany. 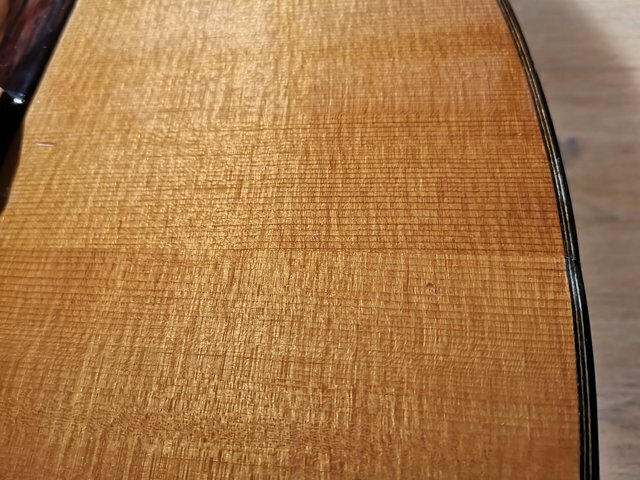 I tried to photograph all the dings + dongs. However, with the light conditions and reflections this was not fully possible, therefore a personal assessment is welcomed. Shipping: on request, but only within the EU and (still) Great Britain. 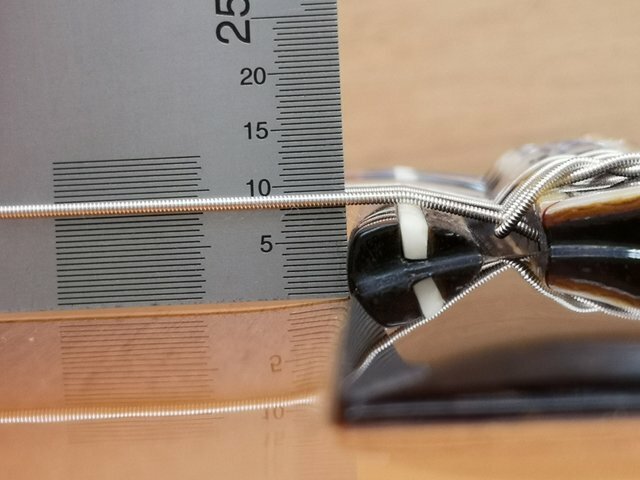 Shipping company and conditions at the option of the buyer. 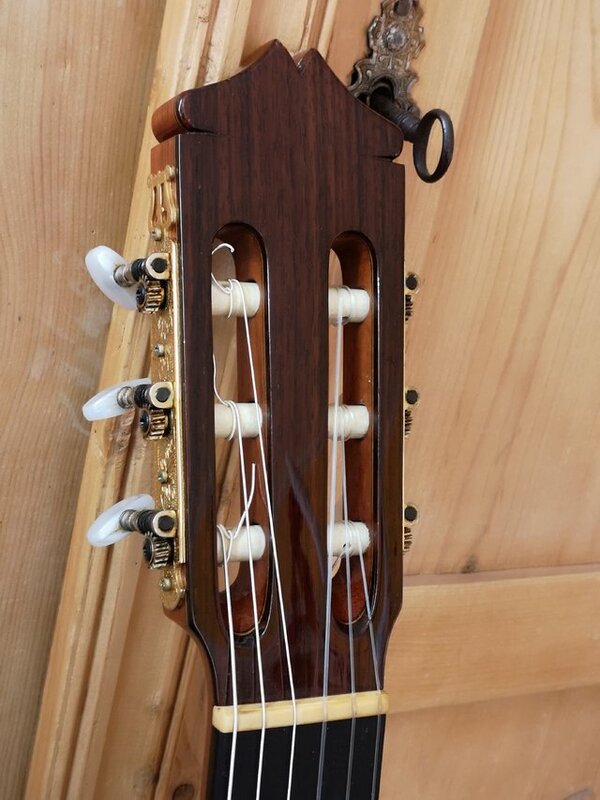 Out of curiosity, what is the heigh of the string over the sound board at the rosette? 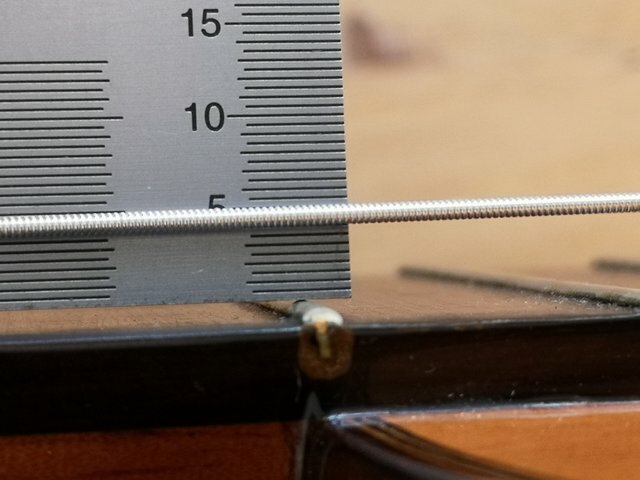 The string heigh at the rosette is 8,5 mm. Please, feel free to make your offer! I had the opportunity to play the Santos compared to a Jose Marin Plazuelo at the weekend. 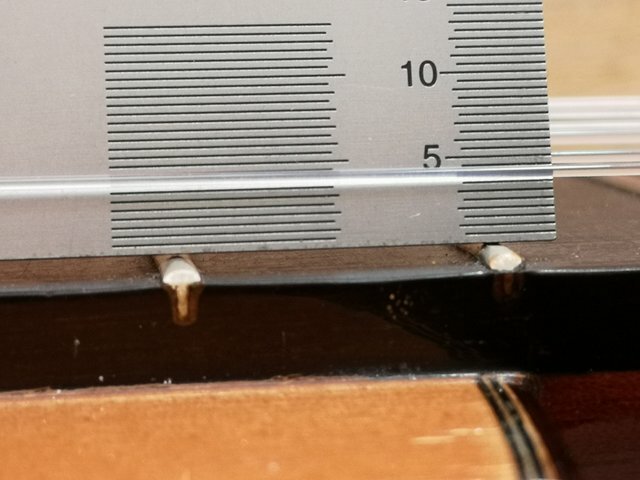 In terms of volume and sustain both guitars were equivalent. 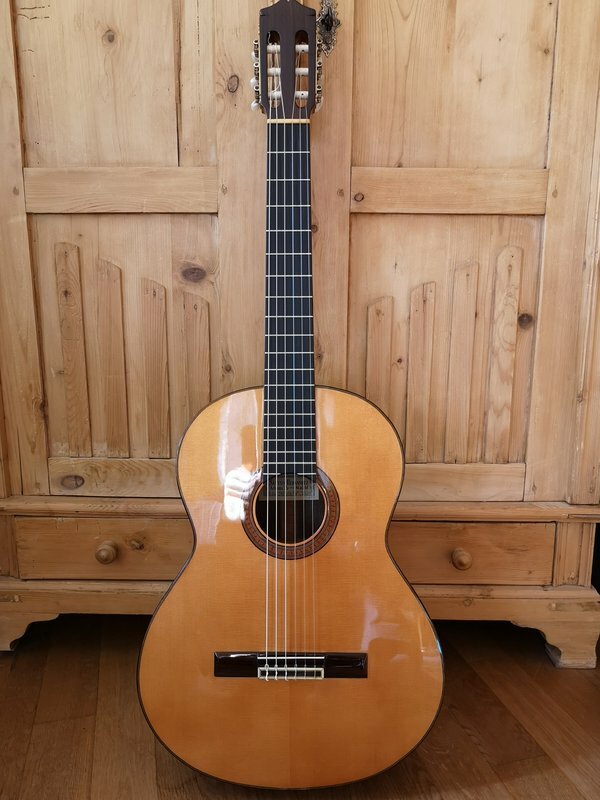 The Santos has in my ears not the brilliance of Plazuelo, but the warmer and more lyrical tone. It's a good price for sure. 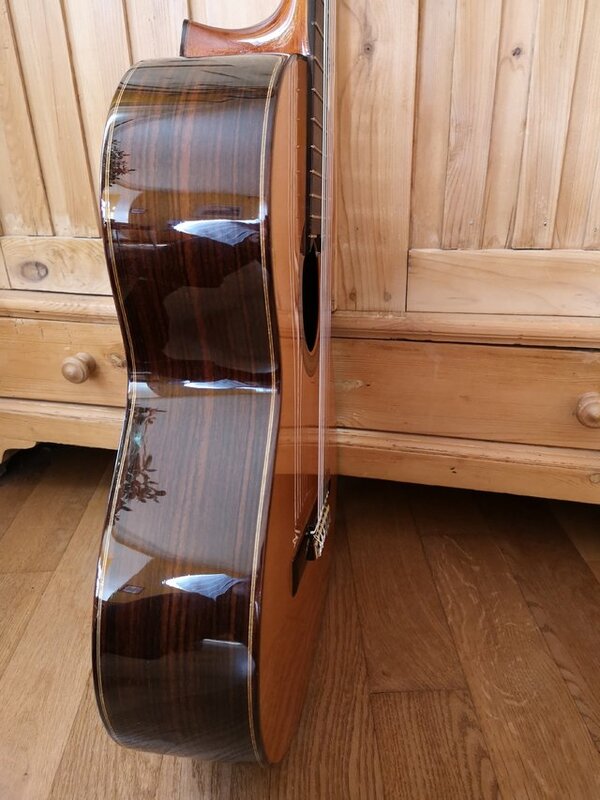 The guitars looks very nice. 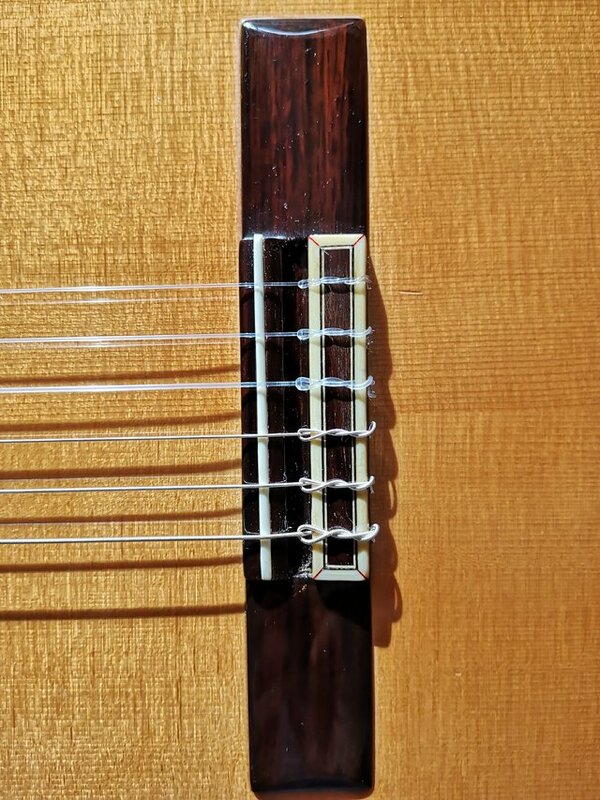 But this guitar needs either a neck-reset or a new fingerboard + new frets. 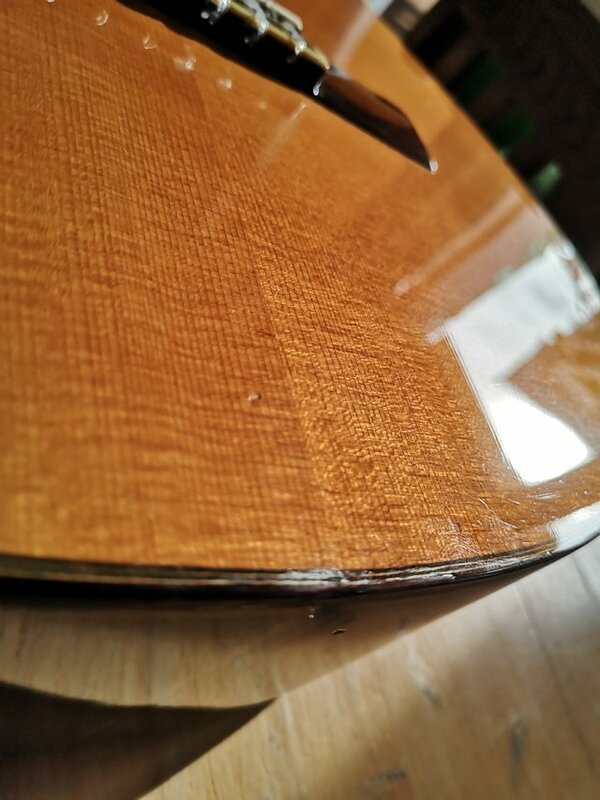 8 mm from the top is almost "Flamenco height", and the action is still high. 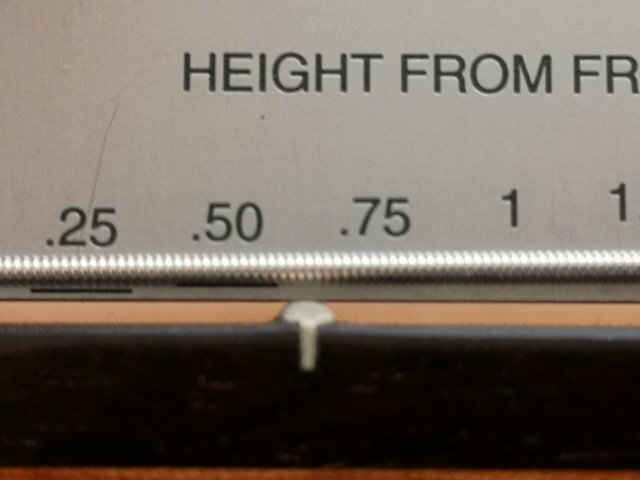 If your measurements are correct, that is?